I've had the privilege of visiting The Wing on two separate occasions: First at its flagship location in Manhattan's Flatiron neighborhood, and second at its newer location in Brooklyn's DUMBO neighborhood. Both times, I have been quite literally stunned by the décor—design team Alda Ly and Chiara de Rege do an impeccable job of bringing The Wing's mission to life, incorporating stimulating pops of color and historical female figures through meeting room names and wallpaper to curate a space that is truly a respite from the outside world. Even the music, which spans Frank Ocean and Drake to Cher and Janet Jackson, gives you the sense that you're truly in a space that understands you. 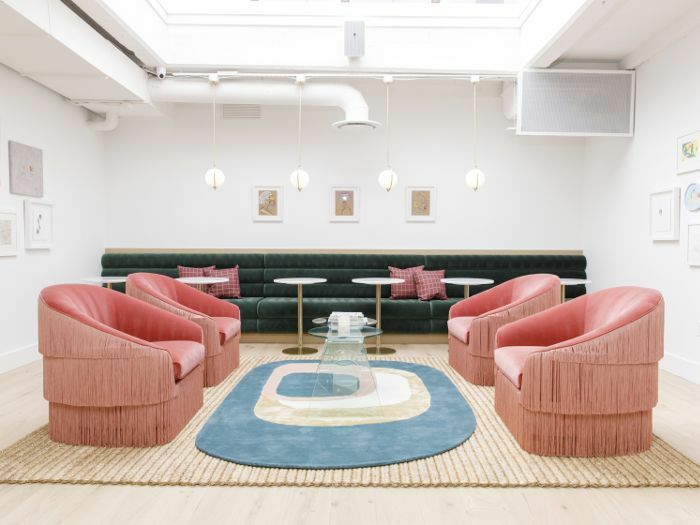 Our unabashed love for this women-only co-working spaces explains why we were so excited to find the exact design references for the new Washington, D.C. location on The Wing's Instagram story. The team gave a tour of the entire space, tagging all of the retailers, designers, and artists behind each specific piece, from lighting and tiling to chairs, couches, and meetings tables. Step inside the new D.C. location below, and shop a few of the stunning pieces hand-selected by designer Chiara de Rege. Next up: The Wing's new DUMBO workspace will make you beg for overtime.